Arrowwood viburnum, or southern arrow wood, Viburnum dentatum. Arrowwood viburnum is an upright, multibranched shrub with slender, elongated, ascending branches and many shoots from the base. Leaves are opposite, simple, 1 to 4½ inches long, oval or rounded; coarsely toothed, strongly veined, with long leafstalks; dull green; lower surface with tiny star-shaped hairs. Bark is smooth, tight, gray or reddish brown; pores cream-colored and prominent. Twigs are slender, elongate, straight or arching, young ones hairy, older ones smooth. Flowers May–June; small, white, numerous in upright clusters 2–4 inches wide, at the ends of branches or on short side branches. Flowers are trumpet-shaped with 5 spreading lobes; the stamens extend beyond the petals. Fruits August–November; clusters of blue or blue-black berries, each 1/4 to 3/8 inch long, globe- or egg-shaped. Similar species: Ten species in genus Viburnum are known to grow wild in our state. Viburnums can be difficult to identify to species, involving (for example) fairly fussy characteristics of the leaves, such as leafstalk length, venation patterns, the number of teeth along one side, and other precise details. Occurs naturally in low alluvial or bottomland woods on terraces and on moist, wooded slopes. If you're thinking about planting it, remember that it grows best in partial shade to full sun, in well-drained soil. Prune immediately after flowering, since it develops its flower buds for the next year during the summer. This shrub overwinters well and grows vigorously, and it's a great native plant to add to your landscaping. In the wild, known only in Shelby County, along the Salt River. Can be cultivated statewide. 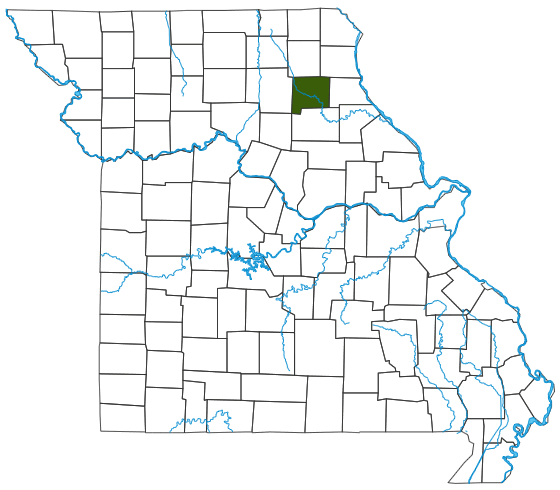 Although it is widespread in eastern North America, it is critically imperiled and a Species of Conservation Concern in Missouri. The white flower clusters and dark blue berries make this an attractive hedge for landscaping. Its dense foliage makes it great for tall screens. It tolerates clay soils and proximity to black walnut trees. Native Americans used the straight young stems as arrows, hence the common name. This species provides food and cover for wildlife. The fruits are eaten by birds ranging from songbirds like cardinals and robins to gallinaceous birds like ruffed grouse and wild turkey. Mammals including deer, skunk, rabbits, and mice eat the berries, too. Deer and beaver eat the leaves.